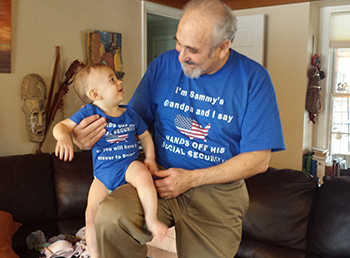 Eric Kingson and grandson Sammy show their support for Social Security. With the book’s release on Jan. 21, the two continue to champion the U.S. Social Security system on the national agenda, noting its extraordinary public support across all demographic and political groups. The right answer to risks facing working Americans and their families, its popularity, they write, also has to do with its congruence with widely held religious, moral and civic values—responsibility to care for parents, children, family, neighbors and selves; hard work and a fair return to such work; and human dignity. With more than a combined seven decades of experience studying, educating, researching and advocating for Social Security, Altman and Kingson illustrate with their book that Social Security works efficiently and effectively. With an introduction by David Cay Johnston, Pulitzer Prize-winning journalist and Distinguished Visiting Lecturer at Syracuse University, the book’s chapters detail what’s at stake in the current policy discussion and what is to be gained for present and future generations if Social Security is expanded. The book covers Social Security’s history and debunks common myths, explaining why expanding Social Security—from increasing current benefits to adding new ones—makes sense, and why the world’s largest economy can afford to pay for expansion and do so in an equitable manner. 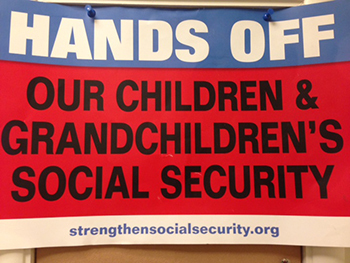 In 2010, Altman and Kingson founded Social Security Works, a Washington, D.C.-based organization focused on safeguarding the economic security of families and individuals by maintaining and improving Social Security’s insurance against wages lost in retirement, disability or death. The co-chairs of the Strengthen Social Security Coalition, made up of more than 300 national and state organizations representing over 50 million Americans, Altman and Kingson served together as staff advisors to the 1982 National Commission on Social Security Reform and were founding board members of the National Academy of Social Insurance. The book’s release in January is significant in that 2015 marks the 80th anniversary of the Social Security Act. Altman and Kingson continue speaking about the book and its messages across the country. In the week of the book’s release, the pair spoke to standing-room only audiences at a workshop of the National Academy of Social Insurance held at the National Press Club and a program sponsored by AFL-CIO secretary treasurer Liz Shuler, with national media interviews continuing daily that have aired on National Public Radio and Sirius XM Radio and published nationally, including Huffington Post, among many others. According to the Strengthen Social Security Coalition, in addition to protecting the middle class, it lifts 20 million out of poverty and is the nation’s largest children’s program. “It is for all generations, now and in the future, for whom we and many others work to expand Social Security,” the authors’ acknowledgements note. A book signing and short presentation, with question-and-answer session, will be held at Barnes and Noble, Erie Blvd. East, on Thursday, March 19 at 7 p.m.